The Bush Hammer has several rows of pyramidal teeth on its faces, which crush the surface of the stone and leave a distinctive texture. In use the tool serves to even-out the contrast of high and low points, softening the surface contours making them more uniform. 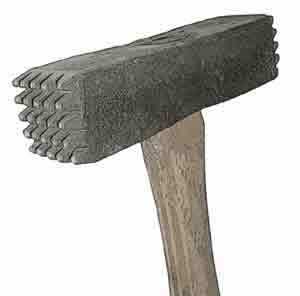 When the hardest carving chisels were made only from tool steel, the pulverizing action of the Bush Hammer was the primary means of shaping granite or hard stone. The advent of synthetic tungsten-carbide tipped chisels that allow these hard stones to be worked in much the same manner as marble often now tends to limit the use of the Bush Hammer as simply a means of applying surface texture. Larger types (with heads weighing up to 6 lbs.) 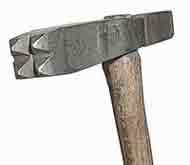 are sometimes referred to as Quarryman's, Granite Worker's, or Mason's Bush Hammers. Two types of large Bush Hammer heads. 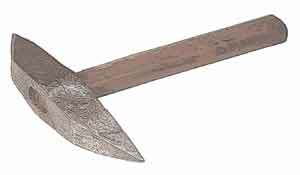 The upper example, sometimes called a Scotia Hammer, has the individual cutting blades attached with bolts so to as allow for sharpening or replacement. 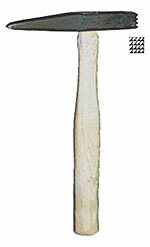 The lower example, sometimes called a Furrowing Hammer, is a type of Mill Hammer made for working millstones. Two examples of the Crandall, a tool in the Bush Hammer family which has removable teeth that are held in place by a simple wedge. 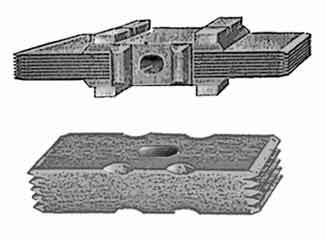 The Crandall was most often used to surface sandstones that tended to simply flake away if struck with the common type of Bush Hammer. has interchangeable faces, thus allowing one tool to span a wide range from coarse to fine textures. Because tool steel is about the same hardness as granite — about 6.5 to 7 on the Mohs’ scale of hardness — granite and similar stones cannot be practically carved with common steel carving chisels. 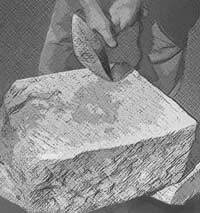 The Pick is used to chip away at the surface of the stone, either to make it more uniform or to shape it in a rough manner much as the Point Chisel might be used. The Pick can remove material more quickly than the Point, but the degree of control it affords the carver is somewhat less. For this reason the use of the Pick is usually limited to the initial roughing-out stages of the carving, although it can be used to provide an irregular texture to areas that are deliberately left to appear as only roughly worked from the 'natural' contours of the stone. One tool made specifically for sculptors combines the Pick with another surfacing tool, the Bush Hammer. 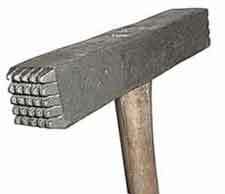 The Bush Hammer, sometimes called a Facing Hammer, is used to pulverize the surface of the stone, evening-out irregularities. Note: The striking surfaces are at left in these two images. One manufacturer makes several other types of surfacing tools in a short version so they may be used in the same manner; the Three Blade Bushing Chisel, the Criss-Cross Chisel, and the Cup Chisel. These examples of Bush Chisel are all made for use in a pneumatic Carving Hammer. Though long versions are made for use in an air hammer (above left), the short versions (above) are much easier to use when a high degree of control is not necessary. This is because the chisel is not held in the hand as the longer versions must be, but instead are just loosely held in the socket of the hammer slightly above the surface to be worked. 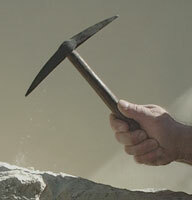 This allows the chisel to 'dance' randomly as the hammer is moved across the surface.